I have finally stopped vibrating from the energizing buzz of ALOHA that has been humming through my body since Janene and I returned home from the Big Island. 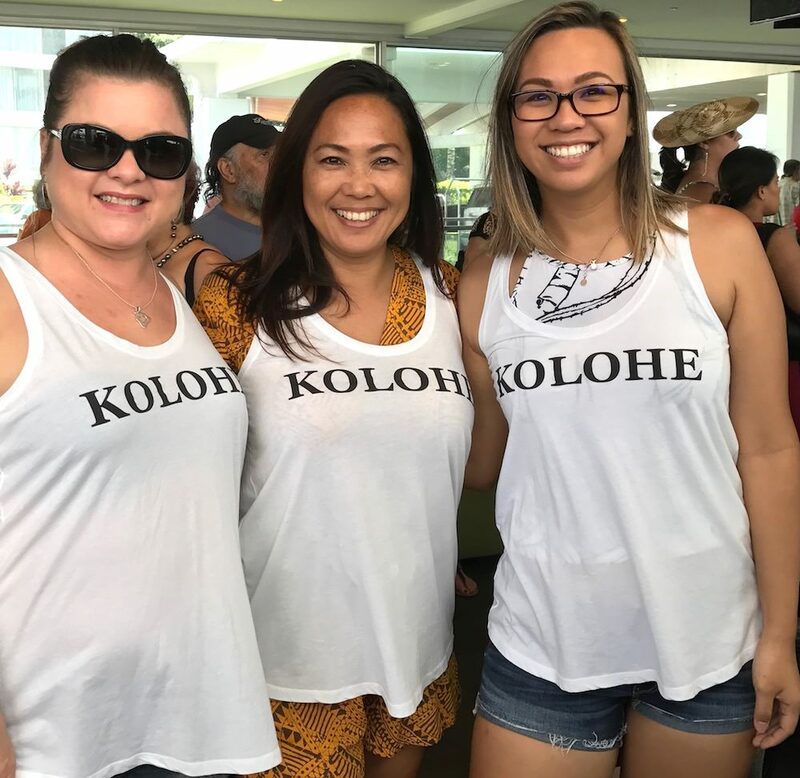 Attending the Merrie Monarch as a vendor at the Grand Naniloa Hilton Hotel was such an amazing journey on Aloha Inspiration’s never-ending magical carpet ride. Surrendering to grace and allowing Aloha to lead us, we were gifted with the most beautiful experience of Big Island ALOHA! 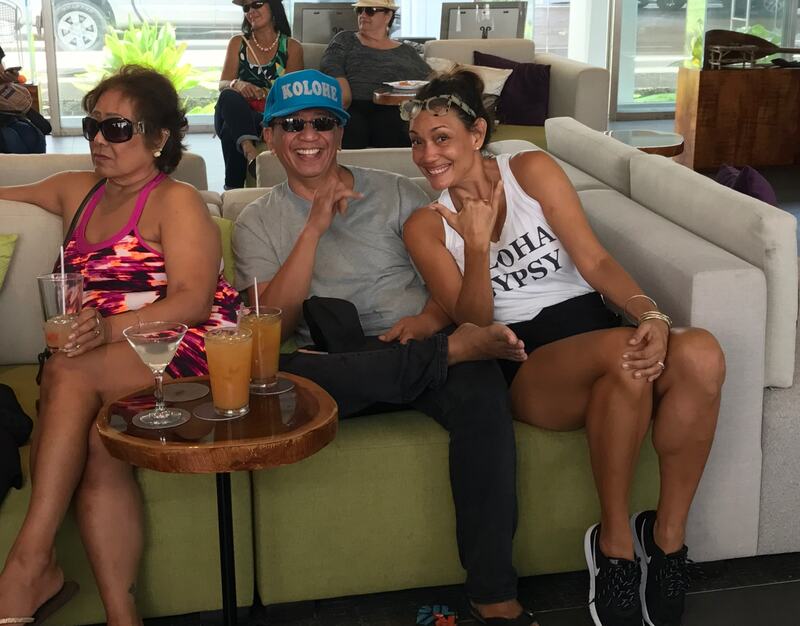 Pat, I would also like to buy a few more letters; an extra L for love, O for Ohana and H for happiness…ALLOOHHA! Seriously, Janene and I were out of our depths, and we had no idea how to prepare for the Merrie Monarch. Pele must have heard our hearts’ desires, and with her fiery assistance, we were able to secure reservations for air, car, and a room at the Naniloa hotel even though it had been sold out for over a year. The only expectations Janene and I had were to have fun, enjoy the Merry Monarch festivities and immerse ourselves in the Big Island of Hawaiiʻs ALOHA! Originally, we were unable to find a single hotel room in the entire town of Hilo. We asked everyone we knew if they had friends or family we could stay with or if they had any hotel connections. My dear friend Hoopii generously offered to let us stay at his mom’s house in Laupahoehoe 45 min away, so we did have a backup plan. 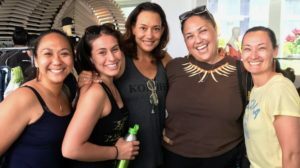 Everyday, for 2 1/2 months, I called the Naniloa reservations and scoured online hotel booking sites to see if there were any rooms that had become available. I was dialing so many numbers I googled for the hotel, that at one point, I must have called the general manager’s phone at the hotel, and left a desperate message seeking a room. The next day, to my excitement and dismay, his manager of reservations, Wendy Karimoto, called to tell me she did not have any rooms. I was on a mission, and two weeks later, I called Wendy back to check on any room cancellations. She must have taken pity on me or knew I was going to be a persistent stalker, and managed to find a room for us. With determination and focus, AHONUI was ultimately rewarded. Janene, Noel Ross and me! I swear, it seemed like Christmas during the Merrie Monarch. Everyone we ran into was so pleasant and enjoyable. It was so baffling that I had to wonder what the Big Island was putting into their water. I have never met so many people open to connection, unabashed, with no agenda other than to talk story and share their lives. It was as if the air was charged with magical ALOHA dust, and we had all fallen prey under it’s alluring trance. 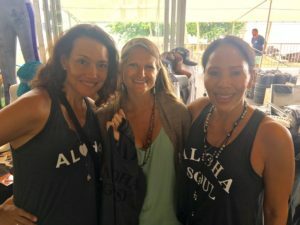 On the first day, we had only been open for 10 minutes before one of the owner’s of the hotel, Noel Ross, bought a Hula Hippie and Aloha Gypsy tank. Janene and I were thrilled with such an auspicious beginning. Noel then proceeded to honor us by wearing our tanks the following next two days. On our second day, three radiant women came by. We thought they were all friends, but it turned out to be a daughter with her best friend and mother. 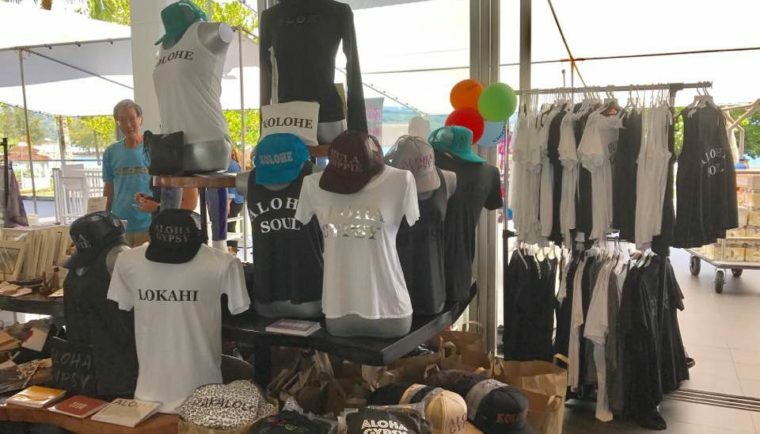 Aloha Inspiration’s products proved to be such a wonderful ice-breaker for connection. Strangers from across the globe came by to share their stories of what Hawaii and Aloha meant to them. 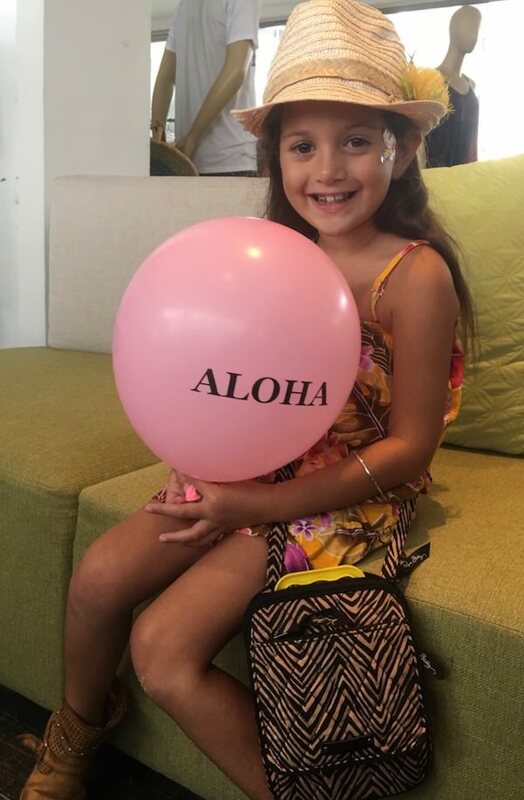 Our hearts were filled with joy and laughter, and the hours flew by as we walaʻau (talked), made new friends, hugged old friends and shared ALOHA! On the tarmac with Janene. When we arrived, we needed a large van to pick us up at the airport, take us to Aloha Air Cargo to pick up our seven XL body bags of merchandise and then drop us off at the Naniloa Hotel. I reserved a car from a company called “Da Best Taxi.” The day before we left, I called to reconfirm the reservation, and found it had not gotten onto the books. Practicing Ahonui (patience), I re-booked and prayed. 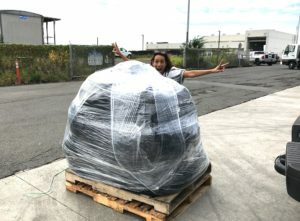 To our delight, Roy, our awesome driver and owner of the company, was waiting for us as promised, and off we went to Aloha Air Cargo. Not only did Roy lift and load every last one of our 90 lb. bags into his van, he stopped the meter while we waiting for our cargo. Our entire trip could be described with the adjective OLU ʻOLU, but Roy’s pleasant attitude was a perfect tribute to the purest form of it. Janene and I had changed our air reservations to one day earlier when we found out the Naniloa Marketplace was going to start the day before we had planned to arrive. Budget Rent a Car wanted an additional $600 for the one extra day. So, on the second day after arriving, I ordered an Uber to go back to the airport to pick up our car. During the 10 minute drive, I mentioned to my driver how desperately my friend and I were looking for tickets. He announced his girlfriend and he were only going to watch the first two nights. AKAHAI threw me into an alternative universe! 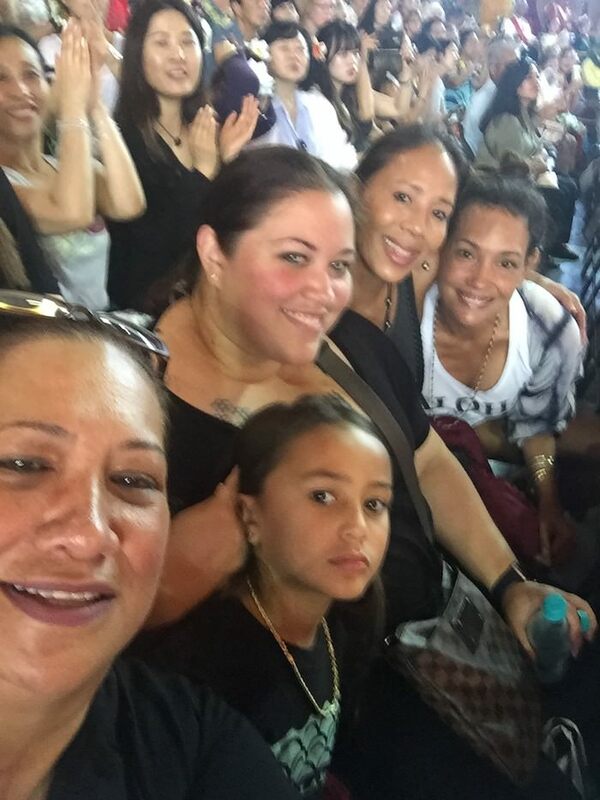 As it turned out, my dear hula sister, Lani Naauao-Ocasek, had extra tickets, so we were able to go to the first night’s Ms Aloha Hula competition. What made it extra memorable was that Tiffany, the daughter of Duane Eldridge, a classmate of Janene and mine, was competing. She won Ms. Aloha Hula after a tie and re-vote by .2 points. Deluged with an overflowing abundance—by the third and last night of the competition, Janene’s cousin and other vendors offered us tickets for the last night as well. Janene and I launched Aloha Inspiration on Oct 9, 2016. If we were to appear on the “Shark Tank” television show, we would be eaten alive, and would make the movie “Jaws” look like a day with “Flipper!” The investors would have a field day when we explained that our business plan is to simply spread and inspire ALOHA throughout the world one tee and tank at a time. Janene and I have no “official” financial plans or forecasts—just a goal for joy and more joy and lots of laughter along the way. We have both agreed, when the laughter stops, we close up shop, hang up our Pau Hana shingle and head to the beach. It is as though I am the right hand and Janene is the left, and together our hands perform the most beautiful hula of grace and gratitude imaginable. The mutual respect, admiration and love we have for each other take precedence over everything, and we seem to have co-created the ultimate business formula. When Janene re-played the conversation for me, it really made us both pause. We were graciously reminded what a unique and rare find our partnership and friendship is, and more importantly, how important it is to nourish, protect and not take it for granted. Janene and I have managed to create the most incredible collaboration and illustration of LOKAHI. Our Unity with Harmony and Business manifesto of ALOHA should be the only business plan that a partnership, whether it be a business or personal, be based upon. I have to admit I was pretty proud of us for manifesting the opportunity for Aloha Inspiration to attend the Merrie Monarch. Not only did we receive an invitation to be a vendor, but all the many other intricate components needed for the trip to run smoothly graciously appeared. Being a fervent believer in the law of attraction, knowing I create my reality and living from a space of grace and gratitude has been my only focus for the past 10 years. Seriously, my life is pretty perfect, and I am proud of the work I have done to achieve a daily life of living in JOY! 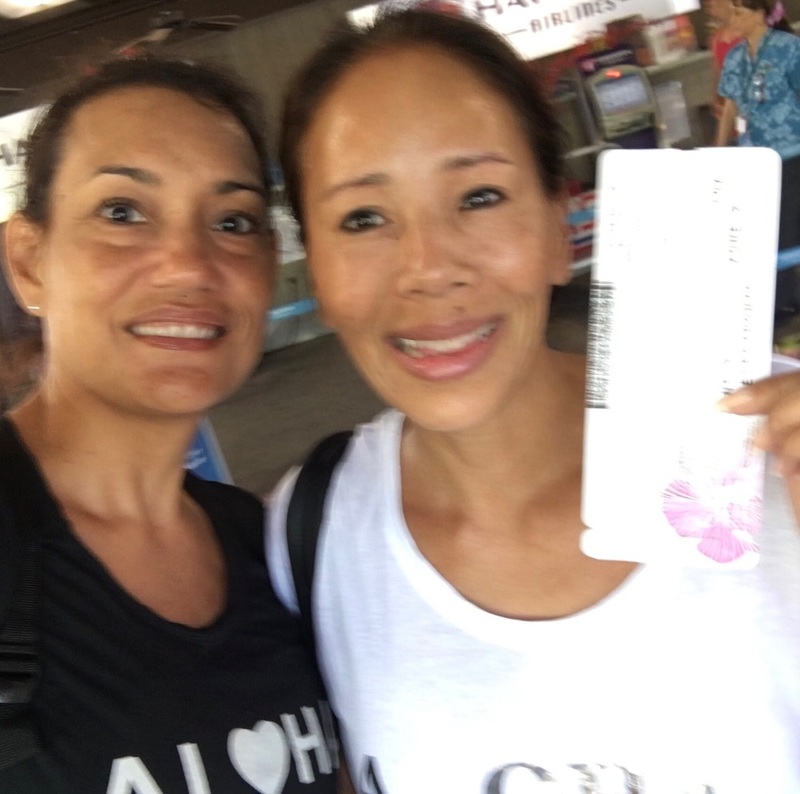 From the minute we stepped off the plane onto the sacred land of the Big Island of Hawaii, we were swept into the whirlwind of the Merrie Monarch cyclone. I have never experienced such pure laughter and happiness, and wherever we went, everyone was so authentically kind. 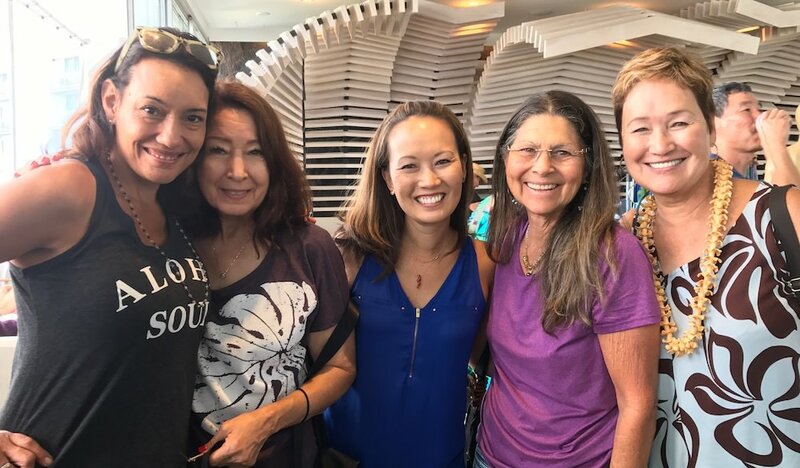 Running into my dear hula sister, Lani, filled my heart with so much joy. It was as if I had fallen into a time warp and travelled back 40 years when my entire life was all about hula. Our table, in the lobby, was smack dab in the heart of the surround sound Merrie Monarch Hula vortex. We immersed ourselves in the constant bombardment of the happy stimulus from the lively bar, parade of shoppers, tourists, Hawaiian music and hula dancing. 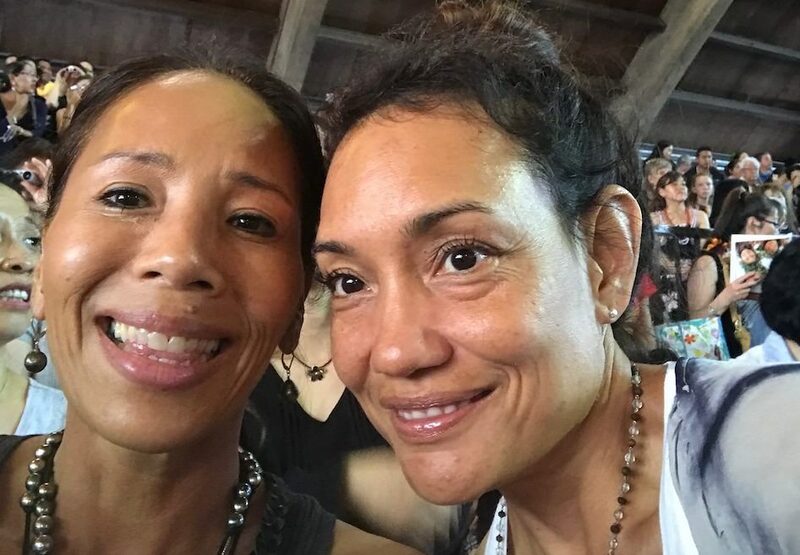 The Merrie Monarch techno beat kept the vibrational energy at an all time high, and I got such a kick out of watching Janene surrender herself to it all. Janene’s body was constantly rocking out to whatever music was playing and unknowingly, she kept up with the intense vibrational level by sustaining her energy with sugar and more sugar. It was so adorable to see her sampling all the food vendors near our table. One day it was poi mochi balls, the next a Samoan Drink made of 100% sugar, the next an acai bowl with cookie dough. On the first night, I fell asleep giggling to the vision of Janene jumping into bed with 3 red vines clutched in her hands. I was not immune in any way to the maelstrom of the powerful pull of energy. Jumping into the same carbo craving boat, I plowed through all my energy bars and nuts in the first day, and I ended up dining on waffles drowned in maple syrup and bagels for breakfast every morning. Janene and I even snuck out bagels with peanut butter to eat for a mid- morning snack. How else are you going to feed that energetic hunger? Sugar is the quickest fix. Even if it had been available, chowing down a kale salad was not going to feed our demanding energetic mistress. At closing on the last day, I left to give Kim and Kanoe a ride to the airport. When I came back, my beautiful partner had all of our stuff loaded on a bellman’s cart, and was lounging on a lobby couch drinking a mojito and eating a bag of Cheetos. I surprised her with our new found favorite poke bowls from Suisanʻs, and we proceeded to inhale them. The lobby was finally quiet, and as I looked out into the ocean, I silently chanted my deepest Mahalo. I have achieved so much in my life, and live such an amazing life of joy. I have worked so hard to find my voice, shine my light and live an authentic life. Our Merrie Monarch experience was just another example of the amazing journey I am on. Yes, I am very proud of myself, but at the end of the day, I know without the guidance, gratitude and clear channel to Source…Ke Akua… God…none of it would be. With deepest Haʻahaʻa I am so humbled for the grace that constantly shows up for me, and I am forever grateful. Deepest Mahalos to Janene Willener my beautiful partner who always makes my heart smile. Thank you for holding my hand and taking the leap with me on this most magical amazing Lauhala Mat ride.